A new approach to permanently seal superficial varicose veins has recently been approved by the FDA. 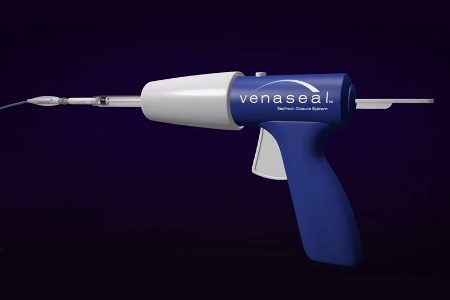 Using cyanoacrylate adhesive, Medtronic’s Venaseal closure system is a minimally invasive approach that can be performed in an office or outpatient setting. Varicose veins are a common problem caused by weakened valves inside the veins. When valves become stretched and lose their integrity, they no longer prevent the blood from flowing backwards in the veins. This backflow leads to blood pooling or building up, causing veins to become enlarged, swollen, or twisted. Sometimes this condition is asymptomatic, but the disease can progress and become painful, causing blood clots, skin ulcers, and other problems. Historically, treatment of varicose veins has been dependent on procedures like laser treatment, radio wave application, or even incisions. A new, less invasive approach has recently been cleared by the U.S. Food and Drug Administration (FDA), according to a recent press release issued by the agency. The technology is the first of its kind to use an adhesive to permanently seal off weak or damaged varicose veins. Provided as a kit, the VenaSeal system uses a specially formulated n-butyl-2-cyanoacrylate adhesive polymer. The polymer is very similar to super-glue and is injected into the veins, where it is allowed to polymerize and harden, thus closing the vessels. In addition to the polymer, the kit contains a delivery system consisting of a catheter, guidewire, dispenser gun, syringes, and dispenser tips. The catheter is inserted through the skin into the diseased vein, and the adhesive is injected, while the proper placement is monitored through ultrasound imaging. This approach minimizes the invasive nature of the procedure, and patients experience much fewer side effects than traditional treatments. “Because the VenaSeal system does not incorporate heat application or cutting, the in-office procedure can allow patients to quickly return to their normal activities, with less bruising,” said William Maisel, M.D., M.P.H., acting director of the Office of Device Evaluation in the FDA’s Center for Devices and Radiological Health (CDRH). The VenaSeal system was originally developed by the North Carolina-based device maker Sapheon, which was purchased by Covidien in 2014, according to a recent article from the Wall Street Journal. Medtronic acquired the technology earlier this year when its purchase of Covidien was finalized.